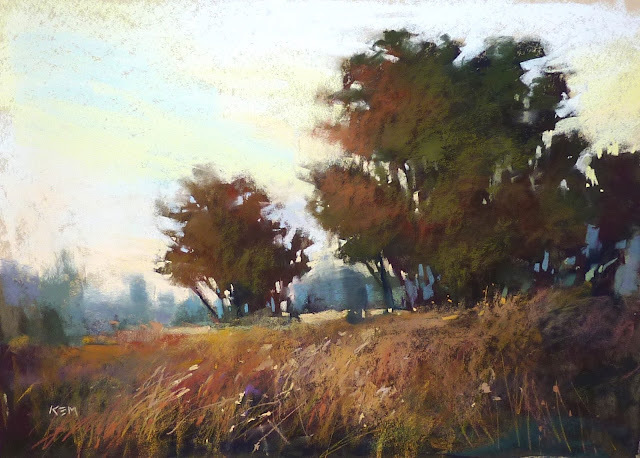 It truly is one of the top secrets to a successful landscape painting. Creating the illusion of depth is something I take into serious consideration every time I paint. If I am successful the painting will invite the viewer to explore....to walk into the painting and discover what lies behind the trees and flowers. There are several ways to create a feeling of space or depth in a painting and they are the principles of linear and aerial perspective. Understanding and using these principles is important to successful landscapes. 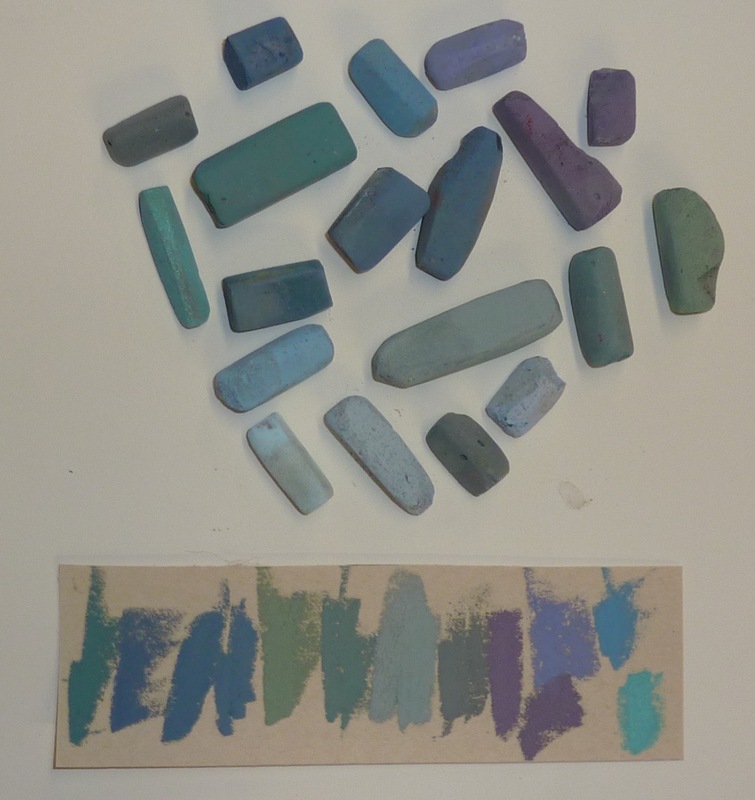 One of these tools is adjusting the value and color of objects as they recede. In most circumstances choosing lighter and cooler colors for the distant objects will make them appear farther away. But what colors are good choices for distant objects such as trees? It is important to mention that color is relative. What appears light or dark or warm or cool changes depending on what is put down next to it. So a warm yellow green will appear warm unless something warmer is next to it....then it may actually look cooler. There are also exceptions to the 'lighter and cooler' rule. For example you might have a shaft of brilliant warm light illuminating the distant trees....these trees would be warm. So with this in mind, there are some colors that I find work well most of the time for DISTANT trees, bushes and even hills and mountains. Look at my photo below for some of my 'Go To' distant tree colors. Notice that they are mostly grayed or neutral blues and violet and blue-greens. They are dull and subtle colors. But they are oh so beautiful for VERY distant treelines. 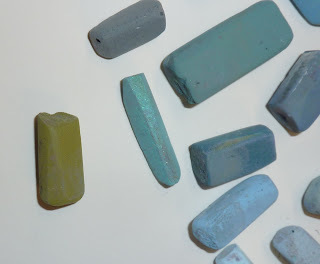 There is a variety of pastel brands in my tray but they are mostly well used Terry Ludwig pastels. 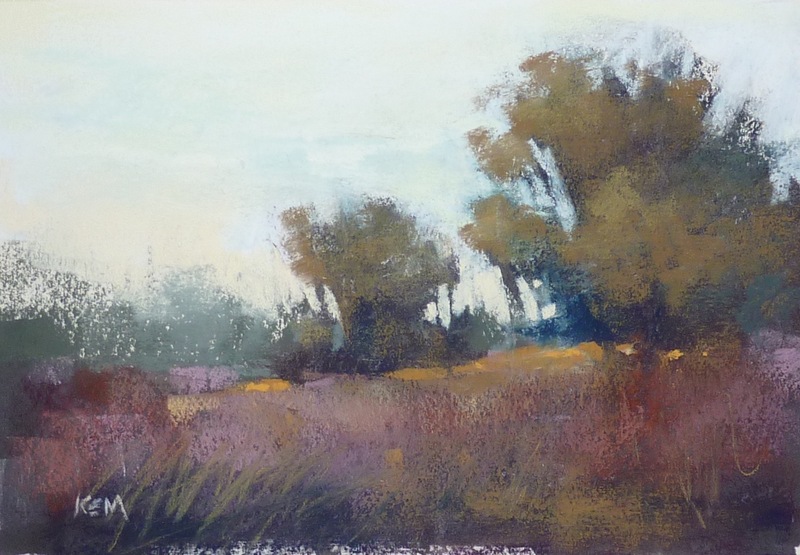 I find that using several of the distant colors in a tree line makes it more interesting. NOTE: In addition to using these great colors in the distant trees, notice that I paint them with no detail. I paint them as loose shapes. There would be no visible detail this far back. This is another principle of aerial perspective. To illustrate how effective these gray blue pastels are for representing distant trees, I placed a warm yellow green pastel in the mix (above) You can see how this green jumps forward. I used it in the big trees in the middle ground but it is too warm (yellow) for the distant trees. TRY THIS: Have a look through your pastels and pick out some gray blues and greens and violets that might work for a very distant treeline. Now use these colors in a painting to test out your selection. Lovely example! The silhouetted misty distant trees in warm blue-gray are wonderful. I've seen them done in violet-cast blue-gray but your green-blue-grays are excellent. Good point that it's even better to vary them and sometimes leave them a bit soft edged, simple flat but varied shapes. Faded bluish silhouettes work well!